When Ceci Iglesias got elected to the Santa Ana City Council she had to give up her seat on the Santa Ana Unified School District’s Board of Education. Now her vacancy must be filled but the SAUSD School Board has bungled this. Early on in the process I emailed the SAUSD Superintendent and asked for an application to fill the vacant SAUSD School Board seat. I never got a reply. Santa Ana City Commissioner Cecilia Aguinaga did the same and was also blown off. It is clear that the SAUSD School Board Member application process has been rigged from the start. 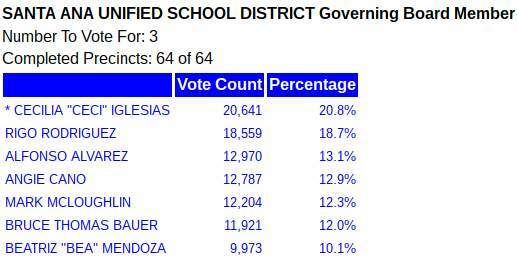 There are now two candidates left that remain in consideration to replace Iglesias on the SAUSD School Board. They are Bruce Bauer, a lawyer who lives in the Floral Park neighborhood and Carolyn Torres, a school Teacher and community activist who grew up in Santa Ana. Bauer contacted me after he lost an SAUSD School Board race a couple years ago to tell me that he had decided to come out of the closet. He was married a few years ago and he and his former wife raised two kids. Now he has become very vocal about standing up for the LGBTQ community. He is also very closely allied with current SAUSD School Board Chair Valerie Amezcua. Torres is involved with Chicanos Unidos. She is, as mentioned above, a teacher. She has no previous experience running for office. Some in the community prefer her over Bauer because she is Hispanic. She is said to be opposed to charter schools however so is Bauer. She is also very liberal in fact she posted recently on her Facebook page that the U.S. Government assassinated Dr. Martin Luther King Jr. Snopes debunked that notion. Can you imagine what crazy notions will come out of Torres’ mouth if she gets appointed to the SAUSD School Board? The next School Board meeting will be held on January 22, when they could select a Provisional Appointment to replace Iglesias. A Special Election should be held instead so the voters of Santa Ana can elect a person of their choice to take the vacant seat. The School District would have to pay up to $300K to hold a Special Election. That would be a small price to pay in our estimate to sustain the rights of the voters in our city. In order for a Special Election to happen supporters must gather 1,500 signatures, I believe in about one month’s time frame. If you vote by absentee ballot you should be receiving your ballot in the mail this weekend or at the start of next week. We have developed this Voter Guide to help you sort through the many candidates and ballot measures. There are three open seats this year on the Santa Ana City Council, thanks to term limits. Incumbents Sal Tinajero, Michele Martinez and David Benavides are out. Why has the SAUSD resorted to lying about their schools’ performance? Why is the Santa Ana Unified School District Intentionally misleading community members and parents on the true academic achievement of the District? 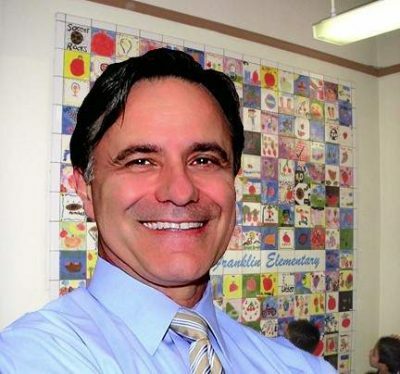 The news from the Santa Ana Unified School District board meeting should raise red flags for anyone with children in the district’s struggling school system. The board voted, 4-1, to hand out pink slips — i.e., layoff notices — to 287 teachers and other educators. The dissenting board member raised real fears of kids being herded into larger classrooms. 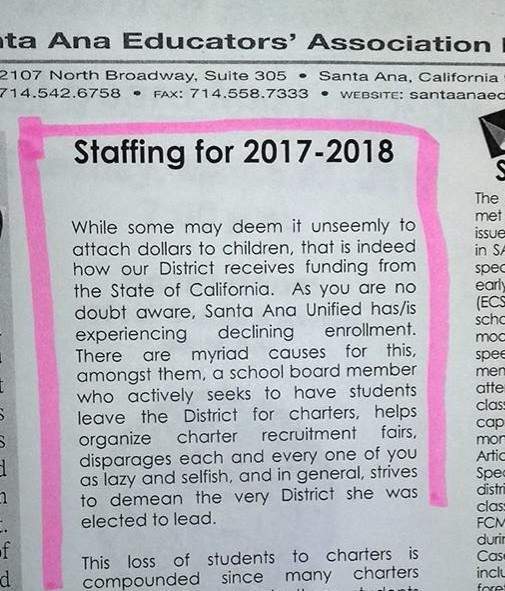 Confronting a financial disaster they helped create, Santa Ana teachers union leaders did Tuesday what they’ve done for years: They blamed someone else. The teacher’s union blames a Trustee for the mess they created! Just want to share on what is happening in SAUSD as I was rudely stopped from sharing during today’s Board meeting. SANTA ANA, Calif. – In celebration of National School Choice Week, California Policy Center along with local charter schools will host the 2nd Annual Orange County Public Charter School Choice Information and Enrollment Fair on January 28 at NOVA Academy Early College High School. The Santa Ana Educator’s Association – the union that represents local public school teachers at the SAUSD, spent months attacking SAUSD Trustee Ceci Iglesias and her fellow conservative Republican, Angie Cano, while promoting their own slate of SAUSD School Board candidates – Rigo Rodriguez, Mark McLoughlin and Alfonso Alvarez. But in the end Iglesias emerged as the top vote-getter in the 2016 General Election while Cano barely lost by only 183 votes. As for the teacher’s slate, only Rodriguez and Alvarez emerged victorious (assuming that Cano doesn’t edge out the latter when the final vote tally is announced this week). The early 2016 General Election results are in and as we predicted Santa Ana Mayor Miguel Pulido is cruising to an easy victory over his ultra-liberal opponent Ben Vazquez. And we are very excited to report that Santa Ana City Councilman and high school dropout Roman Reyna is losing right now to his opponent, Juan Villegas, in Ward 5, by about 1,600 votes. Meanwhile over in Ward 3 Jose Solorio is leading a large pack of candidates with over 44% of the vote and in Ward 1 the incumbent, Vince Sarmiento, is barely edging out his challenger, Jessica Cha, by about 1,300 votes. The absentee ballots were sent to Santa Ana voters this week. So now it is time to vote! This is an important local election as the City Council majority is at stake. Our current City Council majority is trying to fool the voters into giving them a 700% raise via Measure PP. Needless to say we oppose Measure PP. If anything our City Council deserves less of our tax money, not more. Vote No on Measure PP! Latino Health Access hosted an SAUSD School Board candidates forum tonight. All of the candidates participated except for Cecilia Iglesias and Angie Cano. 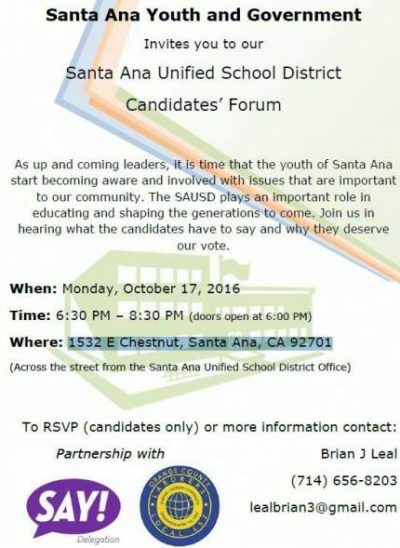 Santa Ana Youth and Government is hosting an SAUSD School Board Candidates Forum on October 17, 6:30-8:30 p.m. at 1532 E Chestnut, Santa Ana, CA 92701. This is the 3rd candidates’ forum hosted by the Santa Ana Youth and Government Delegation. 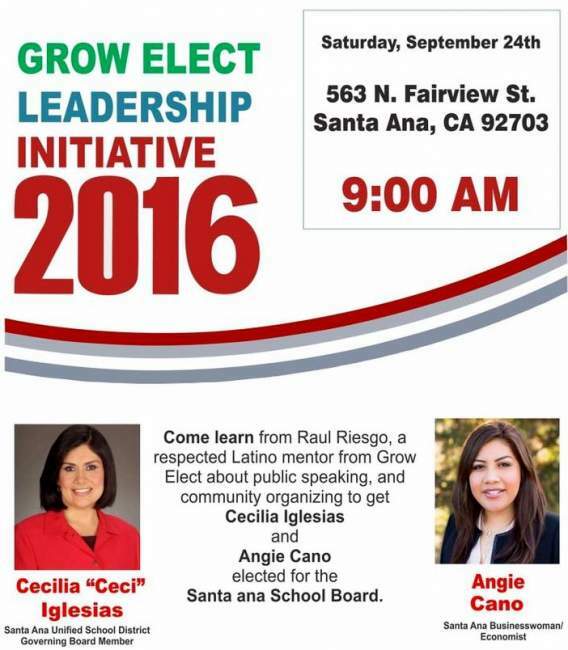 Grow Elect is hosting a Leadership Initiative meeting on Saturday, Sep. 24, 2016, at 9 a.m., at 563 N. Fairview St. in Santa Ana.